>The real soft mobile led screen. Concave or Convex can be achieve easily,the min. diameter of cylinder reach 77 cm (30.31âÃ�Â¯Ã�Â¿Ã�Â½Ã�Â¯Ã�Â¿Ã�Â½). Flexible like a ribbon,concave,convex, polygon shape,or special shape,without GAP. HD no gap flexible mobile led screen.High viewing angle without shadow. Build-In controller and power,none-cable,clean and perfect. >Simple installation and operation with fast-locks and easy plugs. >Slim and light weight design. Thickness only 5.3cm(including Electronic Box),1.3cm(not including Electronic Box),just small installation spacerequired. >With more than just 2 ways for installation. Except stacked or suspended installation,it can also be in magnetic installation. mobile led screen for Cylinder,flexible,special shapes,round shapes stage,conference solutions. 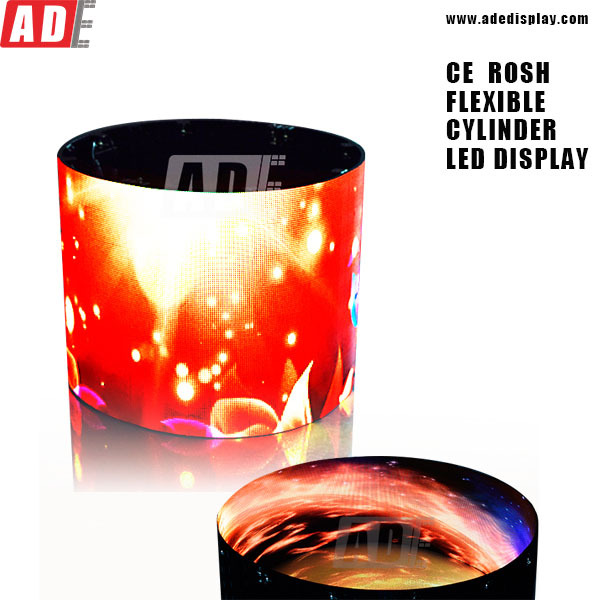 ADE Tech is a manufacturer focusing on creative and smart mobile led screen,which is including flexible mobile led screen,transparent mobile led screen,and provides quick customized solution like Triangle,Round,Cylinder mobile led screen.ADE is committed to provide not only high quality product,but also the best solution for your projects or events. ADEâÃ�Â¯Ã�Â¿Ã�Â½Ã�Â¯Ã�Â¿Ã�Â½s R&D team, with their 7 yearsâÃ�Â¯Ã�Â¿Ã�Â½Ã�Â¯Ã�Â¿Ã�Â½ rich experience,using latest technology developing every mobile led screen carefully and attentively. As the pursuit of perfection but for their extremely harsh,the products are not just âÃ�Â¯Ã�Â¿Ã�Â½Ã�Â¯Ã�Â¿Ã�Â½PassedâÃ�Â¯Ã�Â¿Ã�Â½Ã�Â¯Ã�Â¿Ã�Â½. *Quick customized service-Best helper for your special project. Looking for mobile led screen (Lithe mobile led screen)?